Many streets in Spanish villages and towns are very narrow and cars are invariably parked opposite garages making access even tighter. If someone blocks your car in a town, they will usually be shopping or working locally. You should ask around the local shops and businesses or ask a parking attendant for help before calling the police. Failing that, leaning on your horn (although illegal) may help. Some people leave their cars in neutral and the handbrake off when they double park, so that drivers of other parked cars can move it if necessary. Parking in most Spanish towns and cities is a nightmare – a recent survey found that it takes an average of eight minutes to find a (legal) parking space in main towns, although it takes nearly twice as long in large cities. Parking is restricted in all cities and towns and prohibited altogether in certain areas, although it isn’t usually as expensive as in many other European countries. In major towns and cities, it’s wise to park on the outskirts and use public transport. In many small towns and villages, it’s advisable to park on the edge of town and walk to the centre, as many towns are difficult to navigate with narrow and dead-end streets commonplace. Parking regulations vary with the area of a city, the time of day, the day of the week, and even whether the date is odd or even. In many towns, parking is permitted on one side of the street for the first half of the month (blue and red parking restriction sign marked ‘1-15’) and on the other side for the second half of the month (marked ‘16-31’). In one-way streets, parking may be permitted on the side with even house numbers on even-numbered days and on the side with odd numbers on odd-numbered days. Parking should be in the same direction as the traffic flow in one-way streets or on the right-hand side of roads with two-way traffic. Some towns have zones where parking is regulated during working hours ( horas laborables), when you need a permit covering the period you intend to stay. 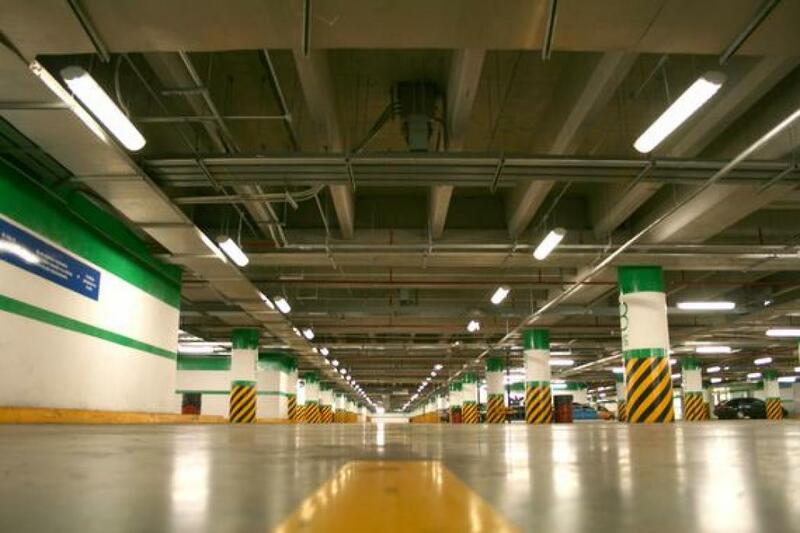 When buying a property in Spain, it’s important to investigate the parking facilities, as few older Spanish apartment and townhouse developments have underground or lock-up garages, or even adequate off-road parking facilities, particularly in towns. Some cities have on-street resident parking areas, marked with black bands on telephone poles and lampposts. Residents must buy a parking card from the town hall (proof of residence is required) and display it in their windscreen. On-street parking is forbidden in many streets in the centre of main cities. A sign saying ‘ estacionamiento prohibido’, sometimes accompanied by a sign with a blue background and a red line through it, means that parking is forbidden. Some no parking signs have a large ‘E’ (for estacionamiento) with a diagonal line through it (any sign with a diagonal line means something is prohibited). No parking may also be indicated by yellow, red or white kerb or road markings. A blue and white curb stone indicates that you can stop briefly, but cannot park. No parking signs also indicate the direction (shown by an arrow), i.e. left or right of the sign, where it’s illegal to park. If parking is illegal in both directions, a sign will have two arrows. A tow-away zone is usually shown by a sign of a hoist on the back of a truck and the words ‘ retirada grúa’. In many towns, private entrances and garage doors have a ‘no parking’ ( prohibido estacionar or vado permanente) sign accompanied by a police permit number enforcing the parking restriction. Parking in front of this sign may mean a fine or that your car can be towed away or clamped. In most Spanish cities, individual parking meters ( parquímetros) have been replaced by ticket machines ( expendedor de tickets de estacionamiento) sited every few dozen metres where parking is restricted, e.g. in areas designated as ‘blue zones’ ( zonas azules), indicated by blue street markings with blue ticket machines. Parking must usually be paid for from 9 or 9.30am until 2pm and from around 4 until 9pm, Mondays to Fridays, and from 9.30am until 2pm on Saturdays. The maximum stay is usually two hours. Buy a ticket for the period required and place it behind your windscreen where it can be seen by the parking attendant. If you exceed your time and are fined, you can often cancel the fine by paying a penalty ( anulación aviso de sanción) (purchased in ticket form from a ticket machine) and either ‘posting’ it in a special slot in the ticket machine, displaying it in your car window or giving it to the parking attendant. This must, however, be done within a limited period. In some towns, an ORA or OTA ZONA system is operated (look out for ‘ ORA ZONA’ or ‘ OTA’ signs), whereby parking tickets for 30, 60 and 90 minutes, are sold by tobacconists ( estancos) and other shops. You punch holes in the ticket indicating the date and time you parked and display it in your car window. Some towns operate a monthly card system (e.g. multi-parking in Malaga). Residents qualify for discounted on-street parking in ‘blue zones’ in some towns. You need to register as resident in the municipality and register your car with the local council. You’re given a residents’ parking card, which you must display in your windscreen. Cards are usually valid for a one- or three-month period. In some cities, you may encounter unofficial parking ‘attendants’ who will demand a fee to ‘look after’ your car. This may simply be a protection racket and, if you refuse to pay, they may damage your car. However, they usually only want around €1 and although, there’s no guarantee that your car will be safe, it may reduce the risk of having it broken into. In some areas (e.g. outside Gibraltar), there are parking touts, who demand a parking fee and take your money and run. Official parking attendants ( guardacoches) are usually uniformed. There are off-road car parks in cities and towns, although these are rarely adequate. Car parks were obliged to introduce parking rates charged by the minute (rather than the hour). Some car parks also charge an entrance fee. Spaces available in a multi-storey or underground car park ( aparcamiento subterráneo) are indicated by a ‘free’ ( libre) sign at the entrance, while ‘ completo’ indicates that it’s full. If you park in a multi-storey car park, make a note of the level and space number where you leave your car (it can take a long time to find your car if you have no idea where to start looking!). On entering most car parks, you take a ticket from an automatic dispenser, usually by pressing a button. You must usually pay before collecting your car, at a cash desk ( cajero) or via a machine. You cannot usually pay at the exit. After paying, you usually have around 15 minutes to find the exit, where you insert your ticket in the slot of the exit machine in the direction shown by the arrow on the ticket. Many multi-storey car parks have video security. Parking fines ( multas) have skyrocketed in recent years and previously free parking zones are changed almost overnight without warning (or streets become temporary ‘no-parking’ zones after you’ve parked there!). Many town halls have allegedly targeted motorists as a way of buying their way out of bankruptcy, particularly through extortionate parking fines. In Malaga alone, with unsuspecting tourists often the victims. A fine of €100 (less 20 per cent for prompt payment) is common for a minor parking infringement, which is astronomical considering the relatively low cost of living in Spain, and fines may be drastically increased if you don’t pay within the prescribed period (residents are allowed 15 days to pay or formally protest a fine). A large number of cars are towed away in Spain, particularly as most Spaniards don’t pay parking fines (in Madrid, only a fraction of parking fines are paid). If your car has been towed away, there may be an adhesive sticker by the side of the road indicating this. Non-residents must first pay the fine (in cash) before paying the towing ( grúa) charge, usually at two different places. You will need to ask a policeman or parking warden where the car pound is. Wheel clamps ( cepos) have been introduced in recent years in some cities. When they were first used in Madrid they almost caused a riot and many motorists attacked them with sledgehammers! They aren’t, however, used to prevent illegal parking in private parking areas or on private land, as in some other countries.